Definition at line 18 of file dsa.h. Definition at line 32 of file dsa.h. Definition at line 26 of file dsa.cpp. Referenced by Botan::DSA_PrivateKey::create_signature_op(), and create_verification_op(). Reimplemented in Botan::DL_Scheme_PrivateKey, Botan::DSA_PrivateKey, and Botan::ElGamal_PrivateKey. Definition at line 69 of file dl_algo.cpp. References Botan::DL_Scheme_PublicKey::m_group, Botan::DL_Scheme_PublicKey::m_y, Botan::DL_Group::verify_group(), and Botan::DL_Group::verify_public_element(). Referenced by Botan::DL_Scheme_PublicKey::algorithm_identifier(), Botan::DL_Scheme_PublicKey::check_key(), Botan::ElGamal_PrivateKey::check_key(), Botan::DSA_PrivateKey::check_key(), Botan::DL_Scheme_PrivateKey::check_key(), Botan::DH_PrivateKey::DH_PrivateKey(), Botan::DH_PublicKey::DH_PublicKey(), Botan::DL_Scheme_PrivateKey::DL_Scheme_PrivateKey(), Botan::DSA_PrivateKey::DSA_PrivateKey(), DSA_PublicKey(), Botan::ElGamal_PrivateKey::ElGamal_PrivateKey(), Botan::DL_Scheme_PublicKey::estimated_strength(), and Botan::DL_Scheme_PublicKey::key_length(). 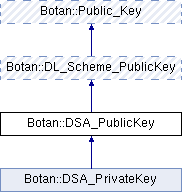 Referenced by Botan::DL_Scheme_PublicKey::check_key(), Botan::DL_Scheme_PrivateKey::check_key(), Botan::DH_PrivateKey::DH_PrivateKey(), Botan::DH_PublicKey::DH_PublicKey(), Botan::DL_Scheme_PublicKey::DL_Scheme_PublicKey(), Botan::DSA_PrivateKey::DSA_PrivateKey(), DSA_PublicKey(), Botan::ElGamal_PrivateKey::ElGamal_PrivateKey(), Botan::DL_Scheme_PublicKey::public_key_bits(), and Botan::DH_PublicKey::public_value().